Majestic Contemporary Estate is situated in the exclusive Park City gated community of Glenwild, on Utah’s #1 ranked golf course, this stunning 10,000 square foot home on 3.38 acres, boasts unobstructed mountain and valley views, backing on to acres of open space, well-stocked with wildlife and the largest, smoothest grass lawn in all of Glenwild. This ultra-private estate is ideal for family gatherings and entertainment. The timeless home is designed with a main floor featuring a living room with wall to ceiling windows conveying stunning views, a formal dining room, library, and gourmet chef ’s kitchen with stateof- the-art appliances. Grand staircases lead to a second floor master bedroom with 360 degree views and separate his and her master bathrooms. 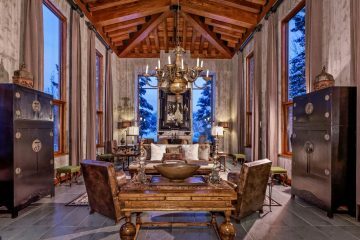 A lower level glass wine cellar, entertainment bar, gym, family room, and home theater complement this contemporary mountain home only minutes from Park City’s three coveted ski resorts, world-class dining and shopping, and just 30 minutes from Salt Lake International Airport.